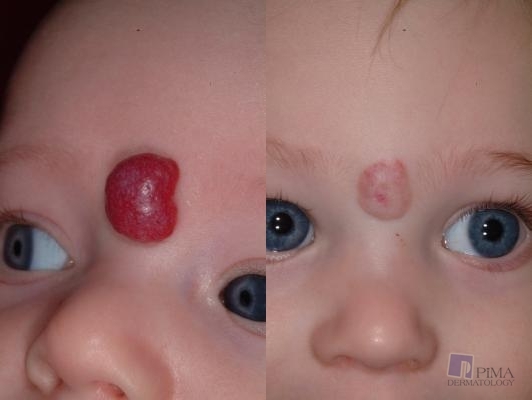 Present in up to 10% of newborns, hemangiomas may become apparent in the first days and weeks of life, expands in the first year, and regress by year 2 – 5 of age. The most serious lesions, as known as strawberry birthmarks, exist on the face and affect function if they occur around the eyes, mouth, nose, and throat. Expanding red/purple lesion which may break down and bleed, become ulcerated, or get infected. Corticosteroid medication can either be injected into the Hemangioma or given by mouth. Treatments may be necessary for weeks or months to suppress rapid growth in the first months of life. Laser Treatment with pulsed dye laser, either before rapid growth or if residual vessels are present after the birthmark shrinks. Surgical revision of localized lesion or the scar and redundant skin, after the lesion is fully regressed. For More Information, Visit Our Library. Next, read about port wine stains.